While Christmas is about celebrating the birth of Christ, through the centuries it is has come to include exchanging gifts, being with family and friends and lots of eating! Since LightWorkers is about all of these things, we thought it would be fun to take a four-corner “Happy Holiday” spin around the globe to see what’s on the menu elsewhere. 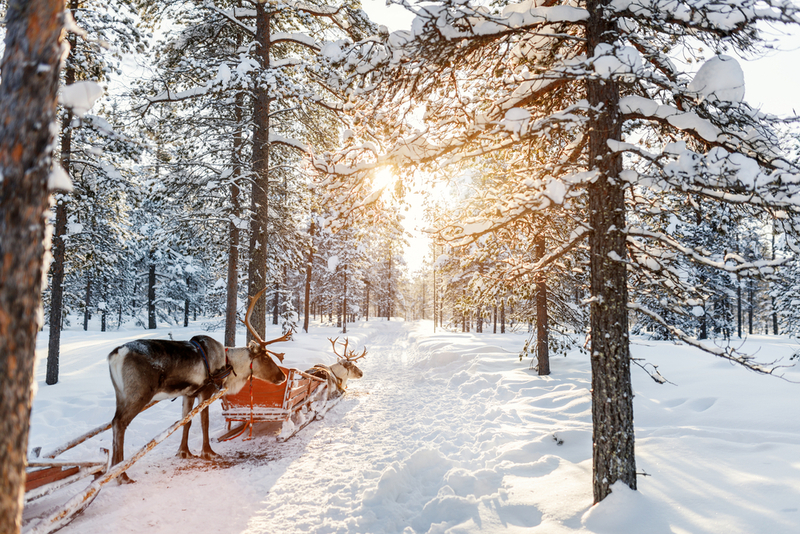 Running the latitude of 66°33′45.9″ north of the Equator is Santa’s Arctic Circle home in Rovaniemi, Lapland Finland. Their Christmas meal is ham, scalloped potatoes, salmon and rice porridge. After dinner, families go to the cemetery to light candles in remembrance of the deceased. Then at some point during the evening, their tradition is to take a sauna. As you can expect, Santa, joulupukki, visits every home, though he comes through the door instead of the chimney. You can try making Finnish Scalloped Potatoes, Perunagratiini. Seems pretty simple. Thinly slice baking potatoes and layer in a deep dish pan. Add a large yellow onion, sliced into thin rings. Then, pour in some heavy cream. Season with salt and pepper. Bake covered for twenty-five minutes, then uncovered for another twenty-five minutes, or until the edges of the potatoes are crisp. 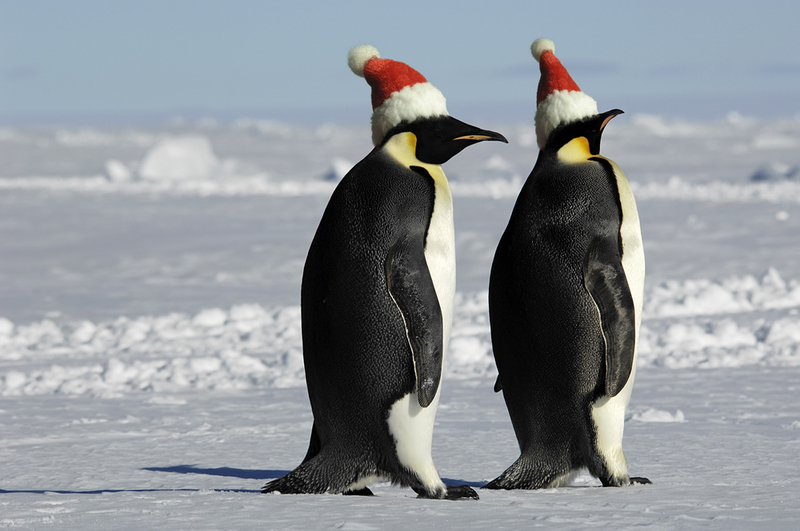 If you truly want a white Christmas, head to the bottom of the world, Antarctica, where the day is celebrated with twenty-four hours of daylight. Even though you are in one of the most remote corners of the world that will not exclude you from being able to enjoy a roast turkey with all the trimmings. However, you might find yourself sharing dinner with some penguins. This is the time of year when they are busily going back and forth from sea to shore feeding their chicks. Spinning around to Hawaii, where the weather is the extreme opposite, and Santa aloha shirts and Christmas leis are the formal dress of the day. Here folks like to celebrate the holiday with a communal luau. Dinner is usually Kalua Pig roasted in an underground oven, an imu. The side dish is Lomi-Lomi Salmon, a fresh tomato, Maui onion and salmon salad. Of course, there is their traditional Poi, which is made from the taro plant and looks like mashed potatoes. For dessert, it is Haupia. This is a coconut milk-based Hawaiian dessert. It is basically diluted coconut milk, sugar, salt, mixed with cornstarch and heated until it becomes thick and smooth, then poured into a rectangular pan and chilled, as you would gelatin. When ready, it is cut into cubes and serve on a square Hawaiian Ti Leaf. Finally, we land in Africa. Contrary to what many may think, Kwanzaa is not celebrated there. Kwanzaa is an American tradition that recognizes the African-American heritage. Though similar to us, Africans celebrate the day by eating turkey, mince pies, followed by Malva Pudding, their version Christmas Pudding. Malva is made with cream butter, sugar, egg, apricot jam, some milk, a bit of bicarbonate soda, flour and a touch of vinegar.